Steve Castle, though only ever referred to as "That Guy", was a stock broker from the 1980s who had a fatal disease called boneitis. There being no cure at the time, he froze himself until one was found, only to wake up in 3002, when, forgetting to cure his disease, he finally died (3ACV21). After being unfrozen in 3002, he met Philip J. Fry at a support group meeting for defrostees. Castle, being a former stock broker, was looking for a new beginning in the future, and together with Fry, he became the new CEO of Planet Express at their stockholder meeting. 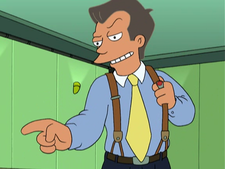 Steve Castle completely changed Planet Express' way of working, by focusing on appearances rather than actual work force, a trick he had learnt from his days in the 1980s. Steve Castle wanted to beat Mom's Friendly Delivery Company, and found himself in a negotiation meeting with Mom. But contrary to what Fry had believed in him, he ended up selling Planet Express to Mom. At the Intergalactic Stock Exchange, PlanEx, the new name for the company, was to be taken over by Mom, and with the stocks he bought from Dr. Zoidberg, he had majority control of the company, so the sale went ahead. Although initially opposed to the sale, the rest of the Planet Express crew quickly became supporters of it once they learned that the value of their stock had skyrocketed upon news of the merger. Unfortunately, during the sale, his fatal disease, boneitis, began its final stages and killed him while he was on the stage. Fry, as vice-chairman, took over the company and his stock. He immediately moved to cancel the deal, but was stopped by the rest of the crew who were more interested in being rich than continuing to work with each other. Fry began an address to attendees of the merger expressing his feelings, which caused the value of Planet Express stock to plummet. The value reached three cents per share upon Fry revealing that a nightgown-clad Professor Farnsworth was to be the new head of the company. Once aware of this fact, Fry triumphantly cancelled the merger. His name, as mentioned on the audio commentary and listed in the script, is Steve Castle, but he is only ever called "That Guy" in the episode. In The Beast with a Billion Backs, he can be seen in the "Space Farm" insurance building, during the beginning of Yivo's invasion, even though Castle died in his previous appearance. Whether this is a goof or he was revived is unknown, but given lack of information, a goof is a likely suggestion. It is of course possible that, after his bones twisted and he was declared dead by Fry, Castle went on and recovered. In "The Late Philip J. Fry", he can be seen when Fry, Bender, and the Professor are fast-forwarding through time in the second universe. He may have been based on Michael Douglas' character in the movie Wall Street because they were both greedy businessmen from the 1980s that worked in the stock market. He wears the exact same outfit as Gordon Gekko (Douglas' character), with the only difference being slightly different colors. He is more than likely based on Gekko. On the Australian cover of the Season 3 DVD set, Steve Castle is drawn with orange hair instead of gray. During his time as communications director, many people noticed a resemblance between Anthony Scaramucci and That Guy. Steve Castle: Back in the 1980s, I was the toast of Wall Street. I was having whiskey with Boesky and cookies with Milken. But then, I was diagnosed with terminal boneitis. Fry: Boneitis? Pft! That's a funny name for a horrible disease. Steve Castle: There was no cure at the time. One drug company was close but I arranged a hostile takeover and sold off all the assets. Made a cool hundred mil. [He laughs and coughs. The group applauds.] Naturally I froze myself until a cure was found. Now here I am, ready to sleaze my way back to the top, 80s style! Steve Castle: Awesome. Awesome to the max. Steve Castle: My only regret is... that I have... boneitis! Steve Castle: Fry, I'm an 80s guy. Friendship to me means that for 2 bucks I'd beat you with a pool cue until you got detached retinas. This page was last edited on 18 September 2017, at 00:51.